Between outdoor mountain weddings, winter weddings and rustic weddings, we've experienced the magic of marriage across the state of Colorado. From Boulder to Windsor to Vail Mountain, check out just a handful of the beautiful wedding days that we've gotten to be apart of. Ohhhh, these two were dreamboats. I tell people all the time that my motto for business has always been to find & work with the couple who wants a marriage more beautiful than their wedding, and these two were the definition of that. Their simplicity and love for one another was inspiring and an honor to be a part of. Their wedding day happened to fall on a very snowy late October day so we used multiple heaters to ensure they had a very cozy tent for all their guests. As I’ve seen in the past, the Lyons Farmette seems to get dreamier with gloomy weather - we experienced weddings with flash flood warnings, and blizzard warnings this season and both events up being more beautiful than ever. Marquel and Jon were high school sweethearts from a small town in Eastern Colorado. Being from a small town in eastern Colorado myself, I immediately fell in love with these two and their families. There is something about a small town, and the community that it creates that will always be special to me. We made sure that their December Wedding day felt like a winter dream and not a Christmas party. Marquel’s mom is an interior designer, so she was able to add beautiful detail to the community center where they got married making the day feel cozy and warm. Haxtun Colorado is filled with amazing people, and getting to know and spend time with them was truly the best way to finish out an incredible 2018 wedding season. Photography | Bokeh Company Catering | Origins Catering Venue | Community Center, Haxtun, Co. When one of your best friends turns 30, she deserves the best dinner party. We wanted this birthday dinner to feel relaxed, but also give our guests a reason to dress up. So we served all pink wines, and Champagne - with a side of cotton candy that we hand spun at the party, we ate off of shared plates and all cheers to one of our very best friends entering a new decade of life! One of my favorite pieces to design on this project was the table. I've wanted to have a dinner party with a low table for months, and finally had the chance to do so with this party! People loved kicking off their shoes and cuddling around a beautiful space filled with gorgeous blooms and delicious food! Ella and Drew experienced the most “Colorado Weather” on their Wedding Day. The weather went from sunny, to rainy, to hail, back to rain, and then finally the most beautiful clear summer evening. And they danced right though all of it. This couple is beautiful in every way - and their wedding day at Sweetheart Winery in Loveland was the perfect match to that. My favorite moment from the wedding day? The Bride Iced the groom when he went to do the garter toss. Doesn’t get any better than that. Mckenzie Coyle is one of those rare women. She is bursting at the seams with talent, and one of the sweetest souls to spend time with. I had the opportunity to spend a week in Paris with her at the beginning of this year and I was in constantly blown away by her photography throughout the whole trip. All this being said, when Mckenzie reached out to me a few weeks ago about partnering for a shoot I was stoked! We wanted to create something minimalistic + bright. Casey from La Rue Floral created an assortment of show stopping flowers to match the theme. For this shoot I decided to use really basic slate flatware, and gorgeous dinnerware. The light, simple napkins are tied loosely to convey an easy going feel. Emily and Rudy are the type of couple that a Wedding Planner dreams of working with. Not only did this couple have the most effortlessly beautiful style, they were so excited to be married and it was clear that ending the day as a married couple meant more to them than other any wedding detail. This rainy wedding day was absolutely unforgettable. The first time I met Natalie, I knew I wanted to work with her. She is a total boss babe - she's just 22 + owns her own salon, she has the most gorgeous tattoos - including a hand tattoo that I wish I had the guts to get, and she's just a kind hearted, down to earth woman. Natalie + Colton are a beautiful couple. The way they support + encourage one another was apparent even in the three or four hours that I spent with them. Sasha + Cole celebrated their wedding day in Breckenridge, Colorado during one of the most beautiful weekends of the year. Their ceremony was small, and filled to the brim with love and unique moments curated by the bride + groom to ensure that their wedding felt authentic to their relationship. It was truly a blessing to be a part of this couples love story. The only thing more beautiful than this couple is the way they love each other. Julia + Cory are a couple I will never forget. These two could set the world on fire with their love for one another. Working with them was a truly beautiful experience for us. Their Denver wedding was incredible - Julia walked down the aisle to Chance the Rapper while we all cried, their ceremony was filled with words of love + support, the reception featured a choreographed dance to Beyonce, and a homemade playlist by the groom that filled the dance floor for hours. Francis + Nick hosted their breathtaking wedding in the Colorado mountains at 10,000ft. Francis is a designer and her style was impeccable. 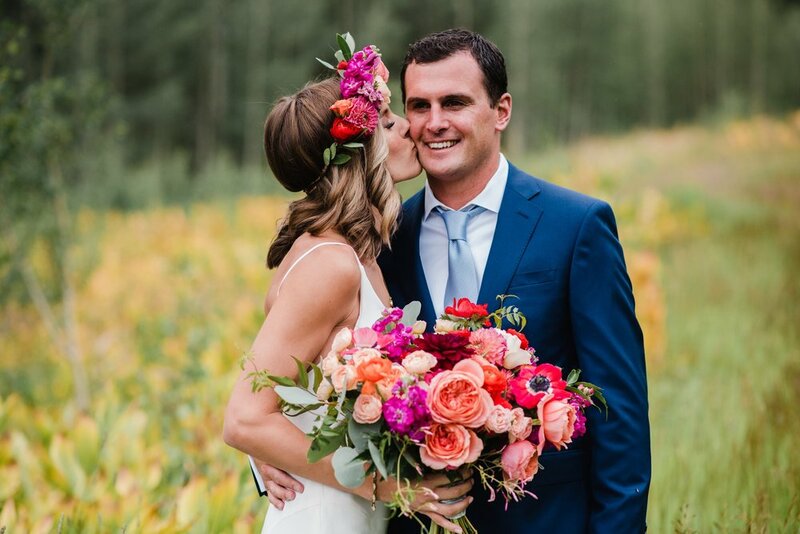 Her style combined with their love made every piece of this Vail Mountain wedding truly stunning. This wedding ceremony featured a some of my favorite things; a chocolate lab with a floral collar, a bold bouquet, and sneaky, uninvited deer. Kelsey + Woody were two of a kind. This couple got married at one of my all time favorite venues, The Highland Meadows Golf Course in Windsor Colorado, on a warm day in July. They added all kinds of fun details to help their personalities shine through. Woody is a coach at one of our local colleges, so each of their vows were intertwined with references to first downs, and defensive plays. It was awesome. Shaylyn + Whitman have a beautiful marriage. These high school sweethearts have been together since Shay was 14 + Whitman was 16. To hear them tell it, they've known they were meant to be together forever. Styling this Tacoma, Washington vow renewal was a dream. To work with this beautiful couple against the lush, green backdrop that Washington offers was a one of a kind experience. It was also an amazing opportunity to work with Jamie Fischer, from Boulder Colorado, on such a fun project.